The only trouble these teachers, acting as board of election tellers (BET) encountered were dead people included in the voters’ list, a drunk entering the voting premises in Mapula Elementary School and acting as a guide, and residents claimed other voters’ identities in a school in Salapawan village. 30-million peso calamity fund ratted out? The city council wants to find out what happened to the 30-million peso calamity fund provided to eight villages in Paquibato District. Two barangay captains from Paquibato told councilors that the MGB tricked them to sign a memorandum of agreement to allow mining operations in their areas. They also said they were given 10,000 to 15,000 pesos each from mining firms. The farmers expected their distress calls to be heard but the City Council session ended Tuesday without a resolution, as the councilors prioritised the approval of a new liquor ban. 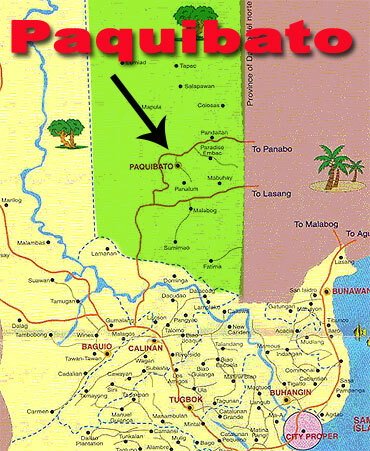 What is happening in Paquibato? The city�s largest district of over 40,000 people, Paquibato has become a virtual garrison these days. People cannot move around the place without identification cards bearing the signature of soldiers. On the veranda of the village hall of barangay Mabuhay, government soldiers mounted an M60 machine gun, a menacing reminder among its residents of the silent war in their midst. In a place called Crossing Hasil towards the border with Panabo, soldiers at a checkpoint stopped all vehicles for inspection. Earlier this month, a fuming Mayor Rodrigo Duterte had declared he will keep his hands off Paquibato, raising fear that rights of civilians might be violated in the resulting armed clashes between government and rebel forces in the area. Paquibato has long been considered battleground between the military and the Communist New People�s Army. Its hinterlands have been a stronghold of NPA leader Leoncio Pitao, the elusive Kumander Parago whose 20 year old daughter, abducted and killed on March 4 in Davao city, was buried last week. Duterte has kept �good rapport� with the rebels through the years, a policy that relatively kept peace in the area in the past but which apparently clashed with army�s thrust to crush the 40-year old insurgency through military might. Read on.